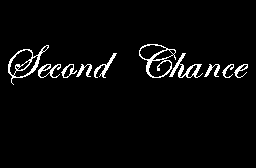 This thread is for all the things you need to discuss and/or clarify regarding my quest, "Second Chance." All information is found on the quest page and the expo thread. Edited by Elixie002, 06 November 2018 - 08:30 PM. Joel...Joel! I shot at a vine with my bow and arrow and it disappeared, Joel! What is the underlying logic here, Joel!? Beat my first dungeon, quest is pretty fun so far. Although I'd still love to know what's up with those vines. If you're talking about when you pick up the final Stone and text appears, that's intentional. It's only meant to appear once so I tested it anyways and I don't seem to experience the text repeating itself. You are able to read the statues so maybe you accidentally read that? Uhh.... my logic is that the arrows are sharp so they cut vines. Don't ask. I'm not the only one with weird logic I'm glad to know you're having fun with the quest though. I found the vine thing a bit odd also, but not too odd. And the bow is given out in the dungeon with the vines so I think it works fine anyways. Found a bug. 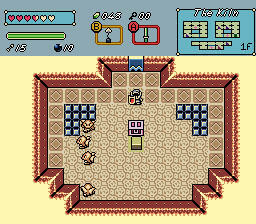 You can enter this room before having the hammer and are forced ether to f6 or die. Oh, and I had no idea I got a the gray tunic when I did until I saw it in my inventory. Not sure if this when intended or not. Edited by TheRock, 07 November 2018 - 10:31 AM. Oh wow, how did I oversee this? Thanks for the report. Also, yes the tunic was intentional. You entered the Somnus State and since that region was fully monochrome, you were too (resulting in you keeping the tunic). I'm liking this quest so far, for the most part. Withholding judgement until the end, but it's sitting at a 4/5 right now. 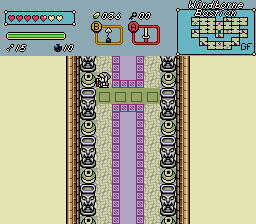 Dungeon design is pretty great for the most part, and the overworld is gorgeous and functional. I'm also digging the total non-linearity. There's no glaring large problems, just a lot of minor ones that start to add up (e.g. 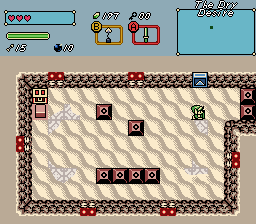 the continue points being a bit wonky and irritating, the backtracking back and forth across the desert to complete the dungeon, the sometimes not-as-good-as-it-could-have-been telegraphing of remote secret switches). I'd also probably have erred towards a slowly refilling stamina meter, seeing as you can get yourself stuck in certain cases, such as the room TheRock pointed out, if you're not careful with your stamina..
Also, with the magic. It refills very slowly. You probably haven't noticed it because of how slow it regenerates, perhaps I'll increase the speed a bit more. 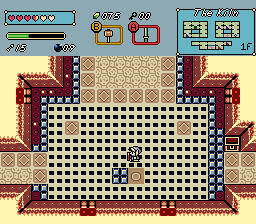 When you do the secret on this screen two of the tiles on the ground to into spikes tiles that are down. The pots on this screen and the pots one screen above you cannot slash them. 1. Two of the dungeon rewards (ice and either lava or desert, I don't recall which) played the pickup string twice in a row. 2. None of them play any music, but given the awkward pause, I'm guessing they're supposed to. If I can hazard a guess, they're looking for an MP3 file instead of the OGGs you switched to cuz of 2.53 MP3 bug. A bit further through, and the quest is continuing to be fun, though the ice dungeon felt a lot less interesting than the other two so far. The graveyard mini dungeon was pretty cool though, though I must protest to the trap room. Edit: Beat it now. I'm short 4 HCPs (I know where one is at least), hurricane spin (I assume) (obviously, since it's locked behind all hearts), and whatever's behind the locked door in the desert. Pretty fun overall. By the way, you can kill yourself with bombs on the credits. Ultimately pointless, but amusing nonetheless. Two of the dungeon rewards (ice and either lava or desert, I don't recall which) played the pickup string twice in a row. This is probably because of the collision change with the mcguffin script. :O You should remove the middle FFCs joel, as no overlapping FFCs are needed for you anymore. Thanks, I'll fix this for the next update. The pots weren't meant to be breakable, but I've decided against that now (the bottom two pots on that screen are still unbreakable). Hmmm ... Tried playing with your update from a few minutes ago, and the music isn't playing for me. The quest and the music are in the same directory. I see that the files are mostly mp3's. Hadn't you changed them to .ogg? Edit: Oh, I see you included both an .ogg and .mp3 version, so I must have downloaded the wrong one. For what it's worth, it looks like a big chunk of red text with the download link at the end, so it's easy to miss the .ogg download. Edited by Joelmacool, 08 November 2018 - 03:27 PM.